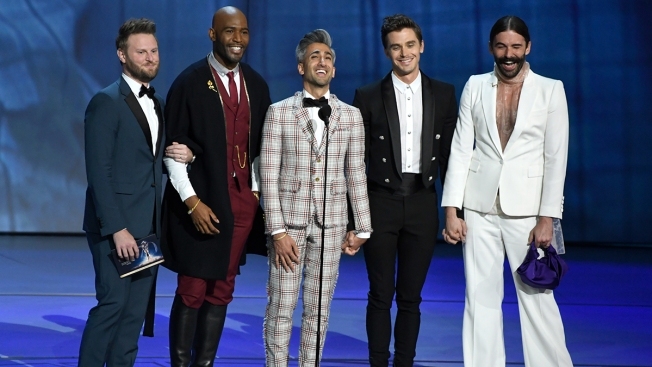 Bobby Berk, from left, Karamo Brown, Tan France, Antoni Porowski, and Jonathan Van Ness, cast members from the television series "Queer Eye," appear on stage to present the award for outstanding lead actor in a drama series at the 70th Primetime Emmy Awards on Monday, Sept. 17, 2018, at the Microsoft Theater in Los Angeles. Jessica Guilbeaux, the breakout star of the newest “Queer Eye” season, shared that fans raised enough money through GoFundMe to pay off her student loan debt and send her back to college to finish the degree she started but never finished. Guilbeaux was kicked out of her home at 16 by her adoptive family when they discovered she was a lesbian. Later, she tried going to the University of Kansas to study computer science, but she had to drop out after accruing too much student loan debt. Her story became the center of “Black Girl Magic,” an episode on the most recent season of the Emmy-winning Netflix reality makeover show. In the days following, fans started a GoFundMe page to raise money for the 23-year-old waitress. In less than a month, they raised $100,000, reaching the fundraising goal.